An exciting time this month as I am officially underway on my Masters program in illustration. Having done my degree in Graphic Design and then meandered into Illustration I wanted to gain a little more insight into pushing my work further. The course I am doing is with the University of Hertfordshire via distance learning (MA Illustration). Not a new concept to me as I teach for the Open University, but I’m intrigued as to how the arts based courses work via online media. 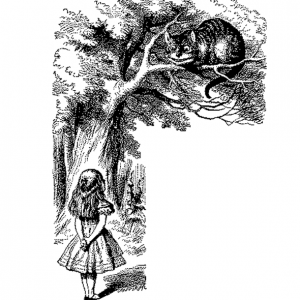 ‘which way I ought to go from here?’ Alice in Wonderland. ← Getting ready for Christmas….not yet please!